The perfect performance pullover, great for layering. 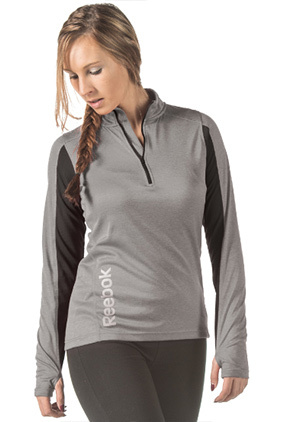 100% polyester, 4.8 ounce performance ladies heather pullover. Reebok PLAYDRY® ¼ zip with YKK zipper. Charcoal mesh colorblocking, side fashion pocket, fashionable thumbholes, & Reebok heatseal on right side of hem. Plaited birdseye mesh on inner layer provides fast moisture absorption and quick drying.